BEST OF THE BEST VOTING HAS BEGUN! For the last SEVEN years you have all voted for us in Best of the Best Castle Rock. The voting for 2019 has started and we would be honored and proud to have your votes again. 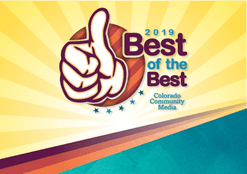 Please follow the links below and vote for Dr. Jessica Herzog and Dr. Paul Stone as Castle Rock’s best Podiatrists in 2019! "From diagnosis to recovery I felt I had the best care available." "Dr. Herzog is the best Podiatrist in town!" "I would highly recommend their practice!" "I've been very happy with Dr. Stone and would highly recommend this practice." "I strongly recommend this facility to anyone looking for foot or ankle care. " "I had a great helpful experience today at Castle Rock Foot & Ankle!" "Thank you Dr. Herzog for your help in making my feet & runs better. Highly recommended!" "My experience with Castle Rock Foot & Ankle Care was exceptional." Foot and ankle problems can place serious limitations on the ability to perform daily activities and basic movements, including walking. At Castle Rock Foot & Ankle Care, located on the Castle Rock Hospital campus in the Alexander building, Dr. Jessica Herzog and Dr. Paul Stone provide effective treatment options for several conditions and injuries that affect these parts of the body. Castle Rock patients with foot and ankle problems, such as ankle sprains, bunions, flat feet, plantar fasciitis, hammertoes, ankle fractures, neuroma or arthritis can find relief from pain and other symptoms. Castle Rock Foot & Ankle Care also provides orthotics, treatments for sports injuries, foot and ankle surgery, LASER toenail fungus treatment, and total ankle joint replacements. Those with foot or ankle problems can rely on the team at Castle Rock Foot & Ankle Care to conduct a thorough evaluation of their condition or injury and determine the best course of treatment. The Castle Rock podiatry practice uses state-of-the-art equipment and the latest technology to provide safe and reliable treatments for many types of conditions that affect the feet and ankles. For the 2nd quarter of 2019 we will be rewarding all of our wonderful patients that refer friends and family to us. For each NEW referral you send to our office, you will get a $15 Amazon card after their new patient appointment has been completed. We will be issuing these via an e-card, so please give your referral your email address. Castle Rock Foot & Ankle Care! Experience a whole different level of care. Dr. Jessica Herzog & Dr. Paul Stone offer exceptional care in a very welcoming medical setting. As local Castle Rock residents, Dr. Herzog and Dr. Stone strive to put relationships with patients and the community first when addressing any medical problem. Dr. Herzog, Dr. Stone and the CRFA staff will welcome you and show you what sets their practice apart from the others. We are at the forefront of technology with new state-of-the-art digital X-Ray in the office. We have been the face of foot & ankle care in Douglas County since the 1990's, when the practice was started by Dr. Jeannie O'Rourke. Both doctors have exceptional surgical training and are Board Certified in Foot & Ankle Surgery. We offer a flexible schedule and will do our best to accommodate your schedule, making your appointment as quickly as possible. Major Insurance Providers Accepted. Here is a short list of the. Please contact the office if you do not see your provider listed. "Definitely a premier foot & ankle operation and I would highly suggest Castle Rock Foot & Ankle Care to anyone who needs to get back on their feet." " I highly recommend Castle Rock Foot and Ankle Care to everyone! I will be taking my parents there for their foot care as well!" "My experience with Dr. Herzog and all the staff was an extremely good one! I highly recommend Dr. Herzog!" "My experience with Castle Rock Foot & Ankle Care has been exceptional and I would highly recommend them for everything from orthotics to surgery." "My feet issues will require lifelong care and I'm finally confident and stress free in knowing I have someone I can trust to do that. Thx Dr. Herzog." "The office staff is all very nice to deal with. I've been very happy with him and would highly recommend this practice." "The staff at Castle Rock Foot & Ankle Care are as nice and caring and competent as I've seen and together, they made a nasty ordeal as good as it could possibly be."